partnering with her this month for the Club Q kit. October greetings to you from Rhonda! I don’t know about you, but I just absolutely love Fall! 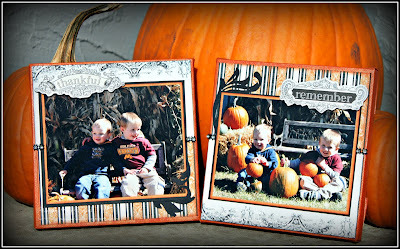 If you’re like me, you are going to totally adore the new October Club Q kits! I’m excited to show you my Club Q re-do for the October Club Q – Altered kit! I always enjoy working on altered projects, so when I opened this kit up with these adorable canvases and the beautiful papers by Teresa Collins, well that was just a perfect match! We recently took our kids to go choose their pumpkins at the pumpkin patch so I knew which photos I was going to use as well. The design approach here was fairly clean and simple; I added a few of those pretty laser cut flourishes for a little extra fun. I loved the combination of Teresa’s super elegant flourish patterns with the hay and pumpkins. A little of the bling trim was just the perfect little touch to add. I used Midnight Confessions and Mango Mai Tai Powder Puff Chalking Inks for this project. First, I base coated my canvases with some light orange acrylic paint, and then misted it with some orange mist. I then used Mango Mai Tai for the edges of my canvases. Tip – to attach glue to the back of those little gems I used a toothpick to control the amount of glue applied. I used the outside part of the black diecut page as a border above and below the strip of photos. 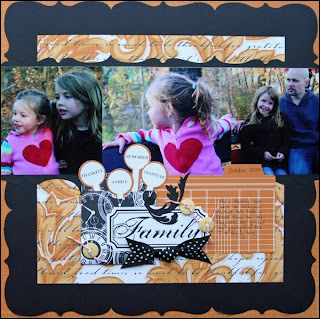 It is meant for scrap, but if you cut them apart you have 4 ready made borders. I absolutely love this kit and all of the diecut pieces that can be layered together. I also used my Silhouette cutter to create the little dancer and scalloped border. I used some of the tabs to fill the pocket. I love that the pockets are part of the punch-outs in the kit. Such a cute page Julie! I love the way you used the tabs!!! These kits are so beautiful, all the projects are fabulous with them!!! Rhonda, those photos are so precious! love it! Julie - you layout is beautiful, i love what you did with this kit. What great projects!~ I love the canvas you did Rhonda..Julie that bow is FABULOUS! both are adorable!!! LOVE Rhonda's idea of putting them on canvas!! !